INDUSTRY.co.id - Jakarta - The non-subsidized LPG consumption of Pertamina Bright Gas 5.5 kg in East Java has continued to grow since it was launched in Marketing Operation Region V Surabaya area in February 2016. Area Manager Communication & Relations Pertamina MOR V, Rifky Rakhman Yusuf said, until September 2017 Bright Gas consumption of 5.5 Kg has reached 961 Metric Tons with monthly average consumption of 107 MT or an increase of 601.46% compared to total consumption of Bright Gas 5.5 Kg in 2016 at 611 Metric Tons. 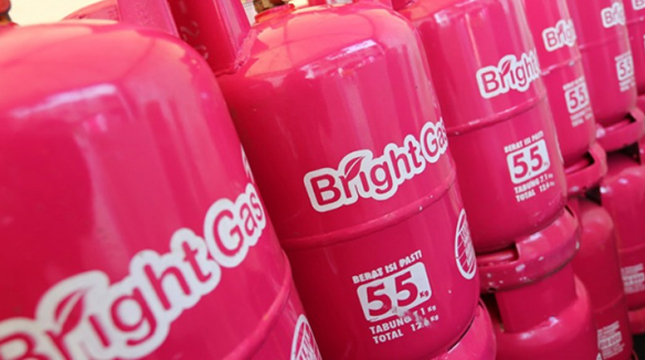 Similar to Bright Gas 5.5 Kg, consumption of 12 Kg Bright Gas continues to increase. MOR V recorded the consumption of 12 Kg Bright Gas up to September 2017 reached 6,167 Metric Tons with monthly average consumption of 685 Metric Tons or an increase of 90.57% compared to the total consumption of Bright Gas of 12 Kg in 2016 of 3236 Metric Tons. "We are grateful to consumers and communities who have purchased non-subsidized LPG, especially Bright Gas, as well as the appreciation and support from local governments that have promoted non-subsidized non-subsidized movements for capable communities. This, of course, influences the sales of non-subsidized LPG, especially Bright Gas, because LPG 3 kg only for the poor," said Rifky in an official statement on Thursday (26/10/2017). Currently the marketing area of ​​Bright Gas 5.5 kg covers all areas of MOR V of East Java, Bali and Nusa Tenggara. For East Java, Bright Gas 5.5 kg has been marketed in all regencies and cities, not only sold in gas stations or Bright Store, but already available in modern outlets such as Indomaret (national cooperation) and Alfamidi. As for the price of the first tube (tube + content) Bright Gas 5.5 Kg sold for Rp 334,000 with refill (refill) of Rp 64,000. "We hope that Bright Gas users in the MOR V area can continue to increase, because it can also measure the improvement of people's economic welfare, because they no longer use subsidized LPG," said Rifky.